I’m Product Management Director for our data roaming products and responsible for spearheading our sponsored data roaming strategy. These products form part of our Intelligent Roaming product suite that provides mobile service providers with a range of real-time-intelligence capabilities to give users the highest quality of experience possible. I work at Syniverse’s headquarters office in Tampa, Fla. I started in 1985 at the parent of Syniverse, GTE, straight out of college, through a special program called the GTE Engineering Associate Development Program. Over my 30-plus years, I’ve worked in seven different business units and been in product management for almost 22 years. I’ve launched products, retired products, managed product lines like our CDMA products through their major growth periods, and, most recently, worked on bringing our latest data roaming products to market. I’m working on finalizing requirements, pricing and delivery for three custom enhancements for a large customer. I’m also working on developing an integrated solution with a business partner to deliver a sponsored data roaming solution for a large customer. No matter what product or service, no matter how complex our designs or back-end processes, at the end of the day, mobile has to work for the user and deliver the best experience possible. We make mobile work, and our customers expect that. Having the opportunity to lead the CDMA Mobile Data Roaming Product team for four years. The team consisted of about 10 members who included a mix of project managers, business information analysts, development and test specialists, and operations and support engineers. Together, we managed the development, support and improvement for one of Syniverse’s major product lines, and over four years, we helped quadruple revenues for this product line. The team’s camaraderie and ability to tackle any challenge – whether it be a specific request by a customer or a problem identified internally by our own team – made our work together such a rewarding experience to be a part of! The opportunity to work with a variety of customer solutions and new technologies, and to constantly learn and be challenged. I use an iPhone 5S. It’s probably time to upgrade, but this model works for me. What’s your favorite app or tool on your phone, and why? Pandora. I love to be able to listen to a variety of music, and I particularly enjoy listening to ‘80s music when I work out. Besides when I sleep, my mobile is usually with me all the time. The longest I’ve gone without it recently is when I flew from Tampa to Boston for a business trip. I didn’t have coverage in flight and didn’t really use my phone, but that was only for about three hours. I like to spend time with my husband and our two teenagers, and one activity we all like to do together is go fishing. I also love exercising, and enjoying fine food and wine. My husband owns a retail wine shop, so this gives us a lot of options to entertain and cook together with family and friends. 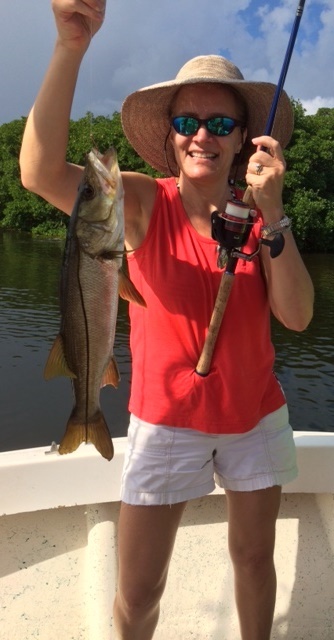 My catch, a snook, on a recent fishing trip at Anna Maria Island, just south of Tampa. 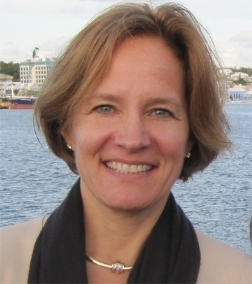 Magda Alberdi is a former Product Management Director at Syniverse.